Veteran engineer and audio circuit designer brings over twenty years of audio design experience with multiple TEC Awards to engineering team. 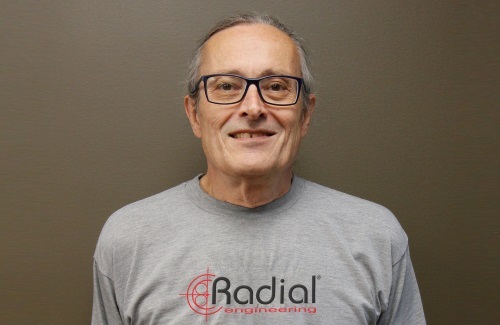 Radial Engineering announces that Craig “Hutch” Hutchison has joined the company as a senior design engineer. In this role, he will be working with the engineering team and product management to develop the next generation of Radial Engineering products. Hutchison joins Radial Engineering with over twenty years of audio design experience. He began his career as a front of house mix engineer for the Guess Who and Burton Cummings. He later moved on to the chief engineer position at Electric Lady Studios in New York. Eventually he found his way to Manley Labs, where he became the chief designer responsible for products such as the Massive Passive EQ, Variable MU, SLAM!, VoxBox and more. After several years at Manley, Hutch was called upon by Rupert Neve to join the team at RND, where he spent 5 years working under Rupert on a variety of products. He has also consulted and designed for several other companies including Fredenstein, Adamson, SSL, A-Designs, Waves, and BAE. The products that Hutchison has designed in full or substantially contributed to have won over fifteen TEC awards with over twenty nominations. He is recognized as one of the world’s leading audio circuit designers.